Having a beard–especially one of epic length and fullness–can take some work. Aside from having a good washing and oiling regime, combing is an absolute essential for anyone who cares about the appearance of their facial hair. Combing daily offers a host of benefits that will help to make your beard look and feel its best. Combing can train your facial hair to grow in the right direction, which prevents ingrown hairs from forming and makes your beard appear fuller and well-maintained. You can also use combing to train your mustache away from your lip so that you don’t have to waste as much time trimming the hairs away. If you use beard oils or beard wax, combing is also an excellent way to help distribute these products throughout your beard while providing full, even coverage without leaving behind any excess. Combing is also an effective way to style your beard into your desired shape and can help freshen up your look throughout the day. 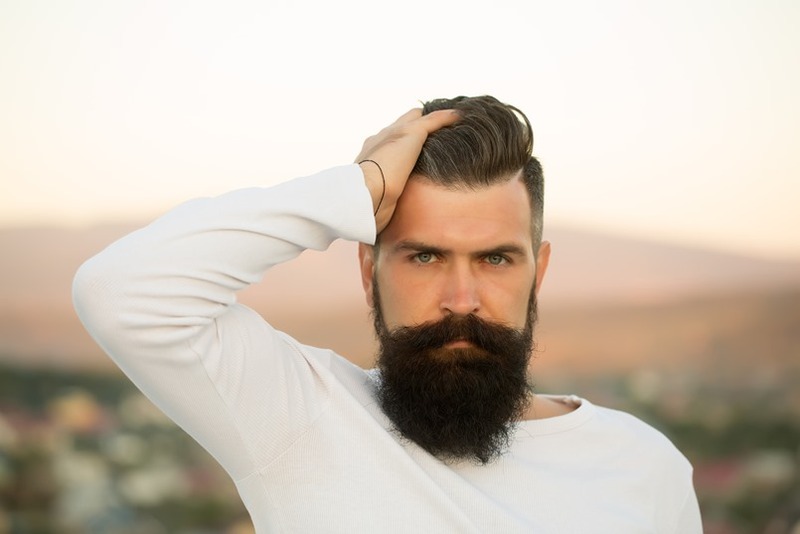 Additionally, combing can clear dust or debris caught in your beard from living your daily life, which in turn makes your facial hair appear neat and clean all day long. After you’ve washed your beard, dried it, and apply some balm or oil, the next step is to comb it out. Combing your beard in the right way is the key to receiving those benefits we talked about earlier. Start combing at the bottom of your beard, or the neck, and work up towards the cheeks and chin. You want to use strokes that go upwards and outwards. Combing this way helps the beard to look fuller, as you separate and untangle hairs, smoothing them in the first direction. Now that you’re beard has been brushed out, you can now begin brushing it back down, styling as you go. At this point, some beard balm might come in handy, as it helps provide a little hold. Finally, comb your mustache away from your mouth, brushing it off to the sides so that it naturally frames your lips without curling down onto them. You may wish to use some mustache wax after for styling purposes, but be sure to comb first. Combing your facial hair isn’t rocket science, but it’s amazing what a difference coming outwards can make in helping your beard look fuller while also appearing neat and smooth. Plastic is a poor material for combs, but metal is almost as bad. Though they’re tougher and come in different teeth widths, metal combs can’t be smoothed and polished like other materials, meaning it has the same damaging, jagged edges as plastic. They’re also producers of static. This leaves the two most popular materials: wood and acetate. Wood combs are relatively inexpensive, but have the advantage of being handmade, don’t cause static, and can have varied teeth widths. Unfortunately, they’re not usually waterproof, which can make them hard to clean. Cellulose acetate, on the other hand, is a waterproof, rubber-like material that is considered to be ideal for beard combs. It has all the benefits of wood combs, plus they’re durable and easy to maintain. Stamp presses are used to mass-produce cheap plastic combs, which can produce tiny, jagged edges in each tooth. Combing out your beard with one can cause split ends, damage to your hair follicles, and cause static to build up in your beard, which is just plain frustrating when you’re trying to achieve that perfect look. Handmade combs are much smoother and sturdier and are made of materials that don’t cause static. Each tooth is sawed, smoothed, and polished by hand, creating a perfect tool for combing your beard. They’re also designed to help stimulate your hair follicles into producing natural oils that make your facial hair healthier, unlike plastic combs. Teeth width is an important consideration when picking out a good beard comb. 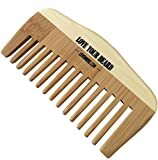 Compared to a hair comb, which has skinny, often tightly spaced teeth, beard combs have bigger teeth that also provide more room between them, making it easier to glide through the coarse hair of beards and mustaches. Of course, different beard types may require different teeth widths and spacing. Softer beards can get away with smaller teeth and closer spacing, while curly and coarse beards may require wider teeth and spacing. If you’re snagging your comb in your beard when you run it through, then the teeth are spaced too tightly. Kent brand beard combs are popular among beard enthusiasts, and it’s easy to see why. Handcrafted in the UK, each comb is made from sturdy cellulose acetate, sawed and polished to create a smooth glide that also helps to stimulate hair follicles and spread natural oils. The set includes a fine-toothed mustache comb, a fine-toothed pocket comb, a fine and coarse-toothed pocket comb. By giving you three options of sizes and teeth width, the Kent combs are perfect for all beard types. As an added benefit, Kent combs are designed specifically to help remove dust and debris from facial hair, allowing for a neat appearance all day, every day. 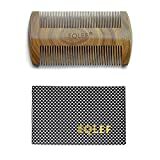 The EQLEF comb is a high-quality, handmade wood comb that features larger, coarse teeth on one side and smaller, fine teeth on the other. Made of sandalwood, the comb has a pleasant scent that is touted to help reduce stress and tension when used. Being made of wood, it doesn’t cause static like the plastic and metal combs we discussed previously. To help protect your comb, it comes with a handy sheath to keep it safe from sun exposure, which can discolor and weaken the wood. This Leven Rose brand bamboo comb has large teeth with decent spacing and is meant primarily for long, thick beards. Like other wood combs, this one doesn’t produce static and is handcrafted for smooth use. The teeth are varied to allow for a little more versatility over other large-toothed combs, but users with shorter and thinner beards may still have difficulty. Though pocket-sized for your convenience, the Leven Wood comb is still somewhat larger than other pocket combs and offers a curved handle that is easier to hold. The bamboo comb has better durability ratings than the sandalwood comb but is also lighter and less of a burden to carry. Small but versatile, this handy little 4.5-inch acetate pocket comb by Kent folds closed when not in use, allowing for better protection of the teeth. The rounded tooth edges help to distribute oil evenly through your facial hair, creating a healthier beard. The teeth and spacing are finer than other pocket combs, which can be useful for trims, training mustache hairs, and styling. This comb isn’t the best choice for combing out long, thick beards, but could be used for small touchups throughout the day. The only major downside to this comb is that it has a limited release, and could go off the market any day. If you’re interested in this comb, get it fast! Handcrafted in Switzerland, this Baxter of California comb is full-sized and features a coarse half and a fine half, which makes it a versatile tool for all facial hair types. Beard aficionados around the world rave about the Baxter of California brand for the sheer versatility and quality craftsmanship that goes into every comb (a 12-step process!). It features an ergonomic grip, which makes it easier to use, and has smooth, rounded tips on each tooth for maximum comfort while combing. The downfall of this particular comb is that it is used so much, the finish can wear off over time, causing the comb to lose its luster. The 5 Best Antiperspirants For Men – Deodorant vs Antiperspirant?